CSSS prevents the needless loss of sight through vision screenings and educational programming. We provide support services to people who are blind or visually impaired. 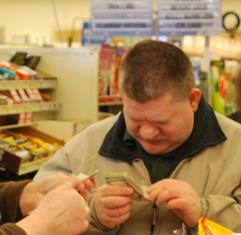 CSSS helps with tasks that keep the blind or visually impaired empowered to live in their own homes. Caseworkers read, assist clients with bill preparation, drive clients to the pharmacy, bank and other appointments, help clients grocery shop. Donate 100% - Add 3% so that 100% of the donation goes to Central Susquehanna Sight Services. Central Susquehanna Sight Services has partnered with Network for Good to securely process your online credit card payment via Network for Good (tax ID 68-0480736). This transaction will appear on your credit card statement as "Network for Good." This transaction is subject to Network for Good’s Privacy, Security & Disclosure Statement and the Charitable Solicitation Disclosure.